Management Committee delay official opening of the Siege Museum. The Management Committee of the Siege Museum are delighted to announce that the Museum has opened its doors to the public on Monday 5th October 2015. Arts and Crafts workshops held to remember the Breaking of the Boom - ahead of 2015 Relief of Londonderry Commemorations. 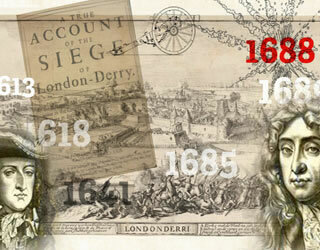 The Siege of Londonderry temporary exhibition is now open again to the public. For the moment we are located in St. Augustine’s Hall, Palace Street until the completion of the New Siege Museum on Society Street, beside the Apprentice Boys Memorial Hall. Come along and enjoy the exhibition which presents the history of the Siege of Londonderry and explains the development of the Apprentice Boys Association and the background to the modern commemorations. Excellent progress is currently being made on the Apprentice Boys Memorial Hall and the new museum. More than 50 fantastic entries were received for the Siege Museum's recent Schools Art Competition. Pupils from Oakgrove, Lisneal, Saint Cecilia's and Saint Joseph's created a piece of art inspired by the Siege, after a workshop with the Siege Museum's outreach officer.